One thing about living near a lake like Pend Oreille; you tend to care a little more about issues like water quality. It is, after all, our shared backyard. When it comes to shedding light on problems and offering up solutions, a better tactic might be ask the next generation their thoughts. As part of their regular curriculum, Brenda Woodward’s science classes at Lake Pend Oreille Alternative High School took part in the Youth Water Summit at University of Idaho in Moscow. 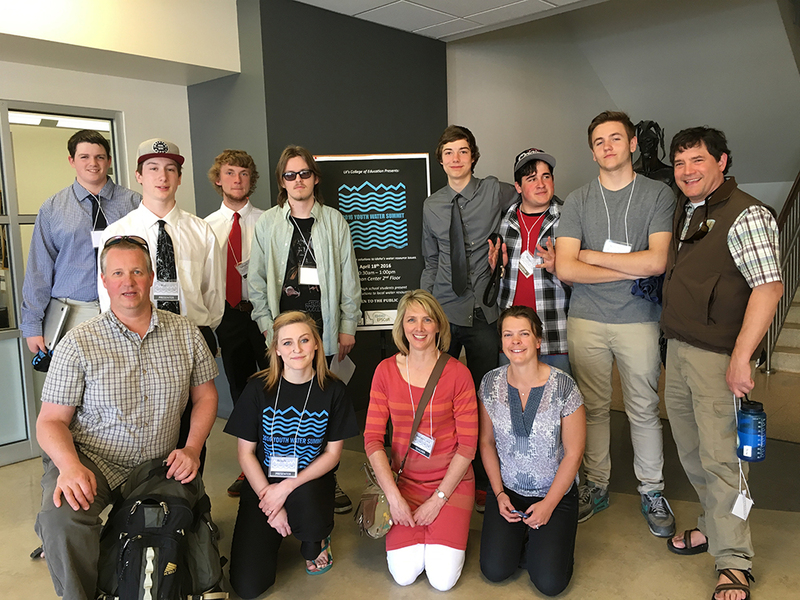 More than 250 students from eight different high schools participated in the Confluence Project from April 20-21, each doing local watershed research projects on issues they care about. Zach Deason and Bekah Davis share their presentation on flowering rush in Moscow. Courtesy photo. 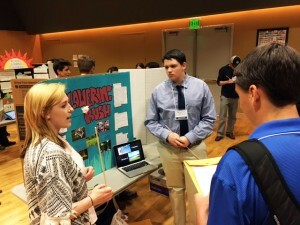 Students presented their projects to university professors, graduate students, agency scientists and other professionals in the community, who served as judges. The students not only reported on vital issues concerning their watershed, but also proposed solutions to help fix the problems. For Woodward, the issue couldn’t be more relevant; especially since we all share the lake as a vital piece of our community. According to Woodward, students like hers could easily be the ones who lead the charge. Some of the students’ presentations were downright innovative in their scope. Take Tommie Casteel, 18, and Nicholas Griffin, 17. Their joint presentation tackled the issue of stormwater runoff into the lake. The solution Casteel and Griffin came up with was the Jellyfish Stormwater Treatment filter—a filtration system that doesn’t use traditional charcoal-based filters which need to be replaced often. Griffin and Casteel want to fine tune their project before eventually presenting it to the city council for possible implementation. “These Jellyfish filters actually sound better than the bio-filtration the city uses now,” said Casteel, referring to the collection stormwater treatment boxes being built around town. The bio-filters use dirt and other organic materials to help filter stormwater, but Griffin said that this promotes evaporation, while the Jellyfish filters put all the water back into the lake. Another project by Bailey Alvarez, 17, and Nicholas Butler, 16, tackles particles known as microbeads (which I confess I had not heard of before their presentation). Front Row: Geoff Penrose, Bekah Davis, Brenda Woodward, Eliza Fox. Courtesy photo. Alvarez said over eight trillion microbeads are released into the watersheds across the nation every day. The problem is so widespread, in fact, that a nationwide ban is set to begin in 2017. “The main issue is that they’re hard to filter out,” said Butler, who helped test different methods to filter the microbeads from water. Zach Deason, 17, worked on a presentation that involves flowering rush; an invasive plant species that is evident in both City Beach and Dog Beach. Deason got the inspiration for his solution from a Karate Kid movie, when a bonsai tree taken next to the ocean didn’t do well because the salt water was killing the plant. With his partner Bekah Davis, 17, Deason proposed a new take on getting rid of invasive species like flowering rush: attack them with salt instead of pesticides. “We dug up some flowering rush and put a salt solution on one and left the other alone,” said Deason. After 15 days, the plant treated with the salt solution was completely dead, while the other was healthy and thriving. Deason said the salt treatment would work well for flowering rush because they can be treated on a localized level, as opposed to invasive species like milfoil, which are widespread throughout the lake. The salt solution stays with the plant on dry lake bed and doesn’t harm the freshwater content of the lake. For their efforts, Deason and Davis received a first-place award. Without plant matter surrounding roadways to act as a sponge to soak up a lot of the stormwater, a higher proportion of the runoff ends up flowing directly into the watershed, carrying pollutants with it. Mitchell said over 138 million pounds of salt is used each winter in Idaho, according to the Idaho Transportation Department. Eric Ulbredch, 18, worked on a problem many don’t recognize as a water quality issue: bullfrogs. Ulbredch also said bullfrogs have a skin disease called chytrid fungus which kills any amphibians they come into contact with. For his field work, Ulbredch went to Round Lake State Park and attempted to count bullfrogs with his spotlight. Since female bullfrogs hatch up to 20,000 eggs per mating season, it’s easy to see how the species can quickly get out of control and wipe out neighboring species. Ulbredch’s solution was to investigate sterilization techniques some scientists are using to reduce mosquito populations. “The only problem with these techniques is the cost,” said Ulbredch, who said it costs upwards of $2,400 per injection for genetic manipulation. LPO Alternative High School principal Geoff Penrose said this program was very beneficial for his students, and it will certainly continue in the future.